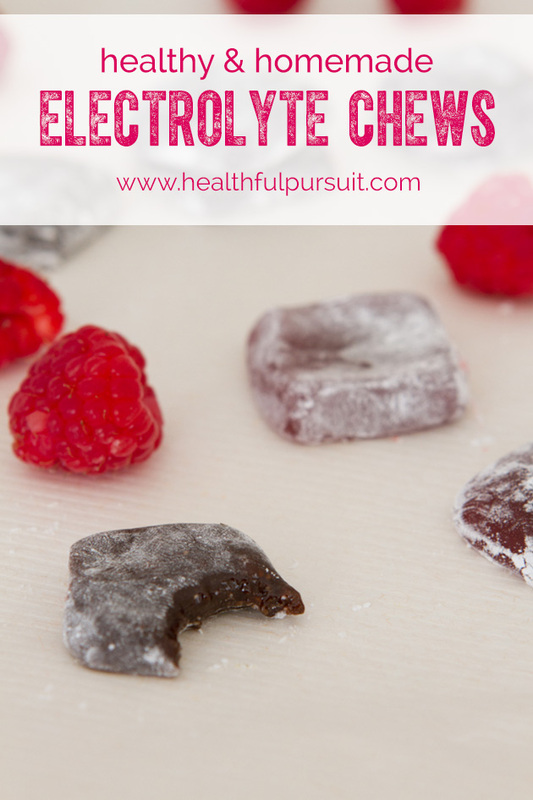 Electrolyte energy chew recipe to help fuel you up and pack power into your next workout or race. Just 6 ingredients. All natural, no artificial colors or flavors. Something I noticed while training for a half marathon, is that portable, clean power chews/shots/blocks are stupid expensive and (many) are loaded with weird ingredients that I would rather not have in my body. I have always been interested in attempting to make my very own electrolyte energy chew recipe. And, after NUMEROUS attempts, I totally nailed it. 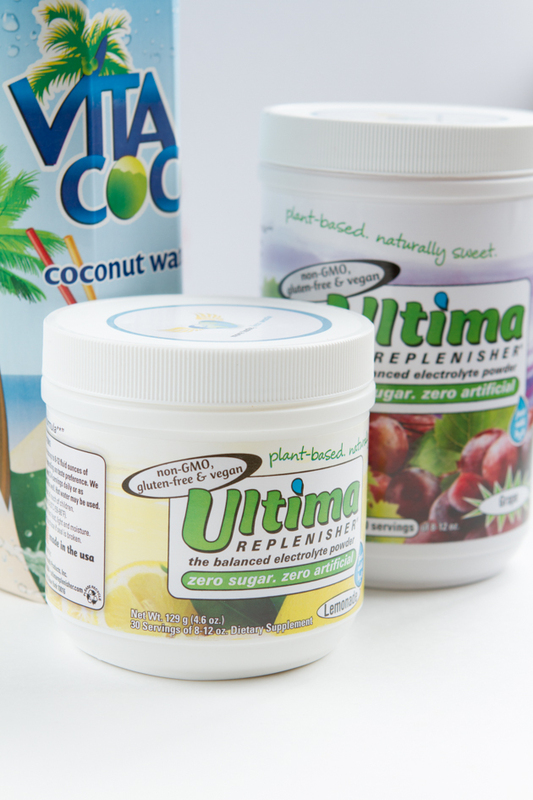 For electrolytes, I chose to use a combination of Ultima Replenisher and coconut water. 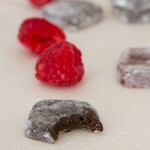 The powder also did a fabulous job at flavoring and coloring the chews without me having to use anything artificial. Clean energy, I opted to use cane sugar in this recipe for a couple of reasons. It doesn’t burn as fast as coconut sugar, it’s very accessible and agrees with my body. Digestive support, many of the chews/shots/blocks on the market use waxes and oils. I found that these ingredients aggravated my digestive system. So, I dusted the tops with tapioca starch to prevent sticking. Worked great! 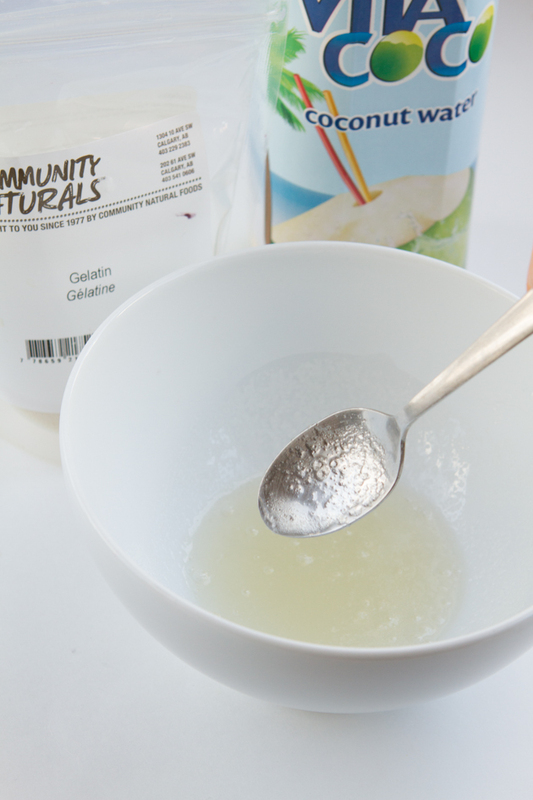 Add gelatin and cold coconut water to a bowl. Allow to sit for 5 minutes. 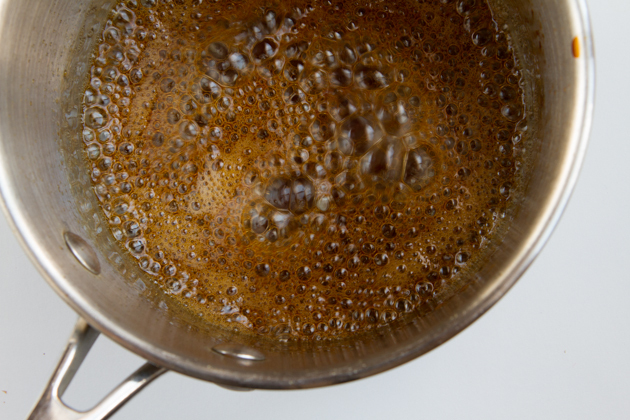 Transfer to a small saucepan and add cane sugar. Bring to a boil on medium-low heat. Once boiling, start timer. You'll want to boil the mixture for 13-15 minutes, being sure not to burn it or over-cook it to the point that it turns solid. At the 8 to 10 minute mark, the mixture will really start to bubble. This is a sign that the mix is about 5 minutes away from completion. Stir frequently. It will be hard to check the consistency in the pot. Recommendation is to swirl it around with a spoon, pull the spoon out of the mix, then check the firmness of the mix. When the mixture drops from the spoon, it should be stringy. 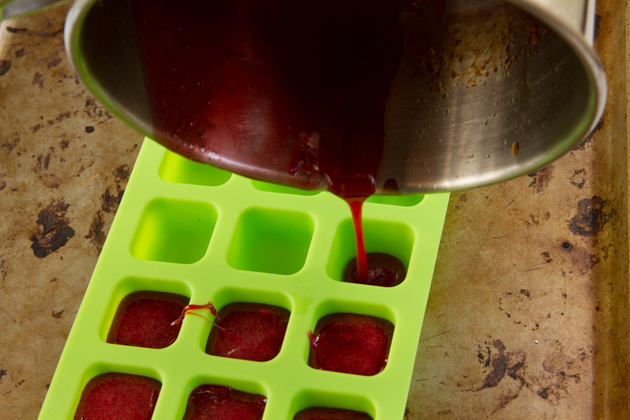 Once complete, add Ultima Replenisher and natural food coloring, if using. Stir until mixed, moving quickly. 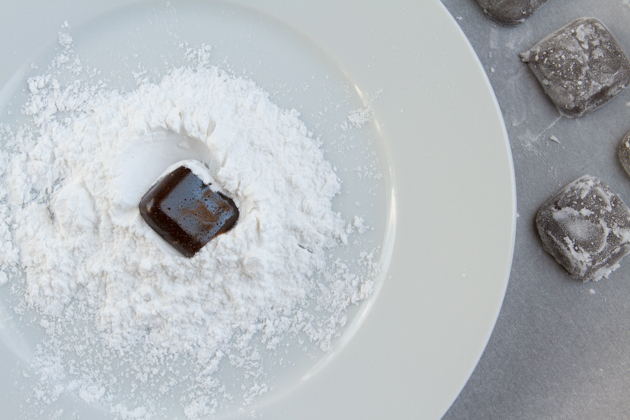 Carefully pour mixture into small silicon blocks, or shapes. I used this silicon mold. Transfer to the fridge to solidify for 1 hour. Remove electrolyte chews from mold and rub with tapioca starch. Place on a parchment paper lined baking sheet and allow to sit for a couple of hours. If chews are too hard, the sugar was too crystalized. If chews are too soft, the sugar was not heated enough. 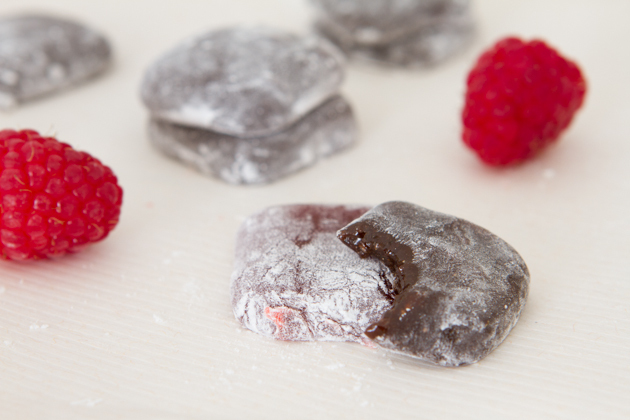 Consistency - If chews are too hard, the sugar was too crystalized. If chews are too soft, the sugar was not heated enough. 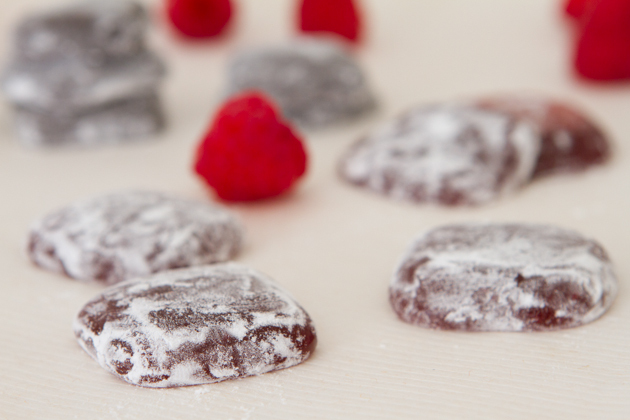 Gelatin - you could try to make this recipe vegan by using agar powder instead of gelatin. Allowing the gelatin and cold coconut water to sit in the bowl is important. Here’s a visual on what the mixture should look like at around the 8 to 10 minute mark. It will be bubbling and foaming. This is a good indication that you’re about 5 minutes away. You can see the consistency here as I pour the mixture into this AWESOME SILICON MOLD. Once chilled, rub each with a touch of tapioca starch and you’re ready to go! Store at room temperature, in the fridge or freezer. They’re stable at room temperature. You could also wrap them in wax paper, too. Side by side, it costs about $5.00 to make this recipe and yields 5 servings, $1.00 per serving. To determine the servings, I compared the nutrition information for my recipe against other chews/blocks/shots to make the comparison as fair as possible. Overall, one could save about $3.00 PER SERVING making these at home instead of buying them. Healthful Pursuit readers can use the coupon code, HP10FS to receive 10% off and free shipping for all US orders on the Ultima Replenisher Website. What store-bought food items have you attempted to make at home? Or, have wanted to make at home?